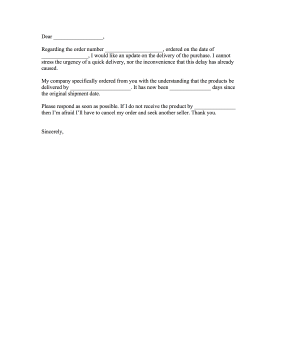 If a delivery has been delayed, this shipment complaint letter demands immediate results. Regarding the order number _____________________, ordered on the date of _________________, I would like an update on the delivery of the purchase. I cannot stress the urgency of a quick delivery, nor the inconvenience that this delay has already caused. My company specifically ordered from you with the understanding that the products be delivered by ______________________. It has now been _______________ days since the original shipment date. Please respond as soon as possible. If I do not receive the product by _______________ then I'm afraid I'll have to cancel my order and seek another seller. Thank you.